Insects are the most common treat for pet hedgehogs. Hedgehogs are insectivores by nature, and a large portion of their diet in the wild consists of insects. Hedgehogs of the wild and the captive bred hedgehogs have different nutritional requirements and needs due to the differences in their activity levels. Wild hedgehogs are often able to adjust to what they eat according to their needs. Pet hedgehogs eat what we give them because it is the only thing available to them. It isn’t a good idea to feed a straight insect diet, because chances are that it will not meet all of the hedgehogs’ nutritional requirements. We suggest using feeding tongs or tweezers when feeding insects. Hedgehogs have poor eyesight and may nibble on your finger trying to get its treat. After it has eaten its treat your fingers will still smell like insects. We strongly encourage you to feed your hedgehogs with insects that are raised as feeders. When you feed your pet with insects you are also feeding your hedgehog with whatever the insects have eaten. Wild caught bugs can carry parasites, toxins, and bacteria. Even if you do not use pesticides or herbicides, your neighbors or nearby farmers might use them. The toxins in the insects can build up in your hedgehog over a period of time. Parasites are found in soils, on plants, and are carried by most types of insects. Livestock, cats, dogs, and many other animals that are outdoors need to be routinely wormed to take care of parasites. Hedgehogs that eat wild caught insects or spend time in outdoor play may also need to be wormed. Insects used as bait are often raised on manure. Manure contains parasites, which are then passed along to your hedgies. Since insects (and all living organisms) can harbor bacteria, it would be a wise safety precaution to remove dead insects from your container on a daily basis. This will help discourage the growth of harmful bacteria that may otherwise prove toxic to your hedgehog. Live insects are the most natural treat for your hedgehog. Live insects provide stimulation and environmental enrichment to your hedgehog. Some hedgehogs are enthusiastic hunters, but others are rather lazy and would prefer not to make an effort to catch their food. 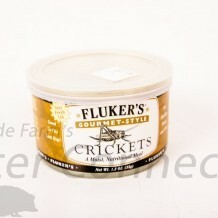 An empty small plastic tub or a 10 gallon aquarium are great places to feed live insects. The hedgehog can learn that when it is placed in such a place that it is going to get a treat, then it will search for the bugs. Then and uneaten insects can be easily caught. We suggest starting out with approximately two-dozen crickets and at least two-dozen mealworms (or a small container from the pet store). It is important to make sure there are plenty of insects so that it will have a better opportunity to discover them. We do NOT recommend SUPER worms as some have reported that these insects can cause internal damage. If you chose to feed Super Worms we suggest killing them first by smashing their heads. Remove the hedgehog when the insects are eaten or when it shows signs of being done. It is time to put the hedgehog back in its cage once it loses interest. Live insects must be container and fed according to their needs. Insects that are not properly housed and fed will not have the same nutritional content. Another type of food you can raise (much more cost effective) is Plaptica dubia roaches. The following information was taken directly from http://www.herpcenter.com/breeding-feeder-insects/breeding-blaptica-dubia.html on 4/20/13. There are instructions for breeding other types of insects as well. Freeze dried insects are available through several suppliers. These insects are sold by weight and are typically the cheapest on a per bug basis. They have a long shelf life and do not smell nearly as bad as canned crickets. Many breeders and pet owners supplement a commercial diet with freeze dried insects and have great success. A simple way to avoid the above mentioned problems is to rehydrate your insects and/or to always have ample amounts of fresh water available. We found this article Rehydrate Your Mealworms (see quote box below) very helpful. Rehydrated mealworms may also be more appealing to picky hedgehogs that do not want to eat freeze dried. 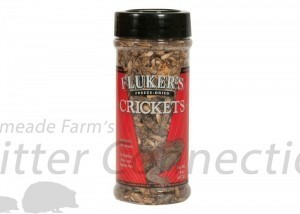 At Millermeade Farm’s Critter Connection we have had great luck coating our freeze-dried insects with Stress Less. Our babies start munching on coated freeze-dried mealworms before they are ready to eat their staple diet. It is also how we bribe momma hogs away from the nest so we can check on and play with their babies! 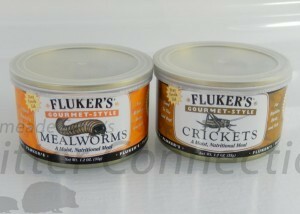 Canned insects are juicy and have the strongest odor. What is stinky to us tends to smell quite delicious to our four-legged friends! Canned insects need to be refrigerated once opened and have a relatively short shelf life compared to freeze dried insects, but are still more convenient than live bugs. Many commercial and homemade bedding options are available for insects that you are planning to keep for awhile. Most stores that supply feeder insects also supply the food to maintain and care for them properly. Proper care of your feeder insects will help ensure optimal nutritional value of the insect for your pet. Hunting insects is something that does not automatically come naturally to captive bred hedgehogs. Hedgehogs tend to use their sense of smell, hearing, and motion detection to locate insects. Hedgehogs that don’t eat freeze dried or canned insects may have better luck eating live insects. Again, to introduce hedgehogs to insects, many owners have found success putting the hedgehog in an empty tub or container and putting the live insects into the tub. The hedgehogs will investigate and sometimes try the insects in the tub when they won’t try them otherwise because it is easier to locate the bugs.